Upgrade your wardrobe with this elegant shirt from the coveted brand, Marie Claire. The superior quality fabric used in its making not only ensures optimum comfort throughout the day but also makes it easy to maintain. It flaunts a stripe pattern, which is the main attraction. Besides, the mandarin neck and the three quarter sleeves lend it a distinctive appeal. 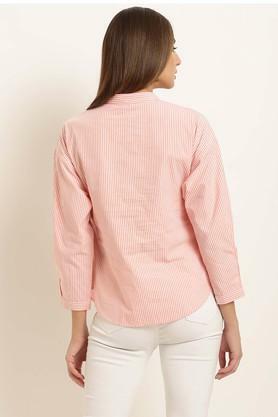 Flaunt a classy look with a great panache by wearing this shirt, which flaunts a mandarin neck. You can team it with a pair of jeans and heeled shoes for any casual occasion.